The Friodur did very well today. I did not eschew the linen, but did 60 strokes (or 30 passes) on it as per normal, followed by 60/30 on the Red Russian, and then for good measure, another 60/30 on a resurrected Old Dog. I got as good a shave as one can get from a full hollow razor, which means exactly both what it says, and also what it doesn't say. With respect to what it didn't say, I have similarly stropped the living hell out out of my 7/8 quarter hollow usual daily razor and I hope that tomorrow - Tuesday - I shall have some kind of summation of my impressions of this method of honing. I think I can foresee the outcome. Both work. Traditional, edge-first honing, works very well as long as you know the steel, your hones and the regime needed for a particular razor. The edge-trailing approach wherein you make a wire edge and break it off allows for ANY razor to get to shaving sharp, even if we don't yet know if it can be as exquisitely sharp as in the prior method when all the variables I listed are known. I repeat, we don't yet know, assuming a theoretical razor and hones, all variables known, which approach would win. My guess is that it might still depend on the "unknown unknowns" (whoever would have thought that Donald Rumsfeld would have left a useful legacy?) of the black arts of metallurgy and forging, wherein one system might work for one blade, and the other approach work better for another. 1. The same razors Todd used are honed edge-first in traditional progressions across ever-finer hones so that there might be a valid comparison. 2. Other users have their efforts recorded on SEM to be able to compare results. To be pragmatic (what the kids describe as tl;dr), my favourite and most used razors can be honed by me in traditional ways that make me happy. I know the hones, the razors and their steels, and what works for those particular examples. 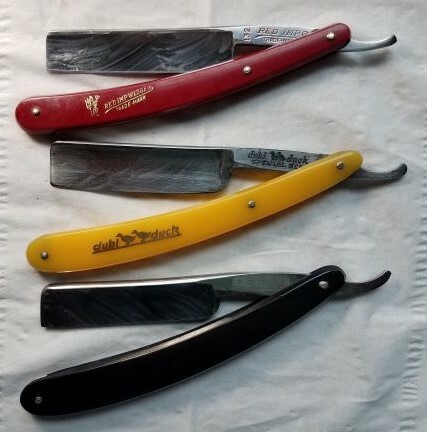 But there are razors that have not responded to those traditional regimes or many variants of them, yet those same razors have become sharp by Todd's method. That might mean he is onto some magically correct approach, or it might just mean I never did quite discover the variation of the traditional approach that is best for them. BOTH ANSWERS ARE LIKELY TO BE TRUE! We are all happy to agree that certain razors prefer some variation of the usual edge-first honing to really show how sharp they can get. Why would it not be equably reasonable to assume there might be just as much variation amongst razors subjected to the edge-trailing method? It is evidently as open to as much variation, experimentation and discovery as the standard method of honing, and it may well be that each method can get equally close to the theoretically perfect edge. No doubt a razor can be honed either way into a state where it will shave, but is one way just a little better? For that razor or perhaps for all razors? For all hones or just those particular ones? More reliable and achievable for the beginner or also true for the experienced honer? Now aren't those questions that should excite any open-minded honer? Let the games begin and let us hope that well-equipped honers with scanning electron microscopes can keep us from error! The information in that blog is not clearly presented, and I appreciate your difficulty. The 1k stone, if needed is for bevel-cutting, and ought to use back and forth strokes. The medium grit hone is to be used edge-trailing - I agree. Metal polish on a denim strop, then diamond on leather, agreed (I used CrO2, but I have come to prefer it over many years). But when you go on to clean denim, clean leather, then linen and then Red Russian leather you are going out on your own. Possibly in the right direction - I find the direction to avoid linen perverse, but I have heard so many times over the years. I feel sure that honing, by traditional or by alternative methods, ought to create a basic decent shaving edge, and that stropping ought to complete and refine the process. 1. The need to strop excessively means there was something wrong with the honing. Stropping is way more important than most realise, but if you get the edge right off the last hone or pasted strop, you don't need to go to town. Stropping comes into its own when preserving an edge, not adding something to one that has been freshly honed. 2. The need to avoid stropping means you are hung up on the pseudo-sharpness of an irregular edge - maybe a wire edge, or maybe just serrated more than necessary from avoiding a decent finishing hone. I have written some years ago on the attractions of a coarsely-honed edge just being used WTG, and it's easy and reliable, and maybe it is what our grandfathers relied upon, but it won't go ATG. I don't begin to believe the things I read on the internet about conspiracy theories, UFOs, Bigfoot, crystal healing, homeopathy or how to burn fat. Probably I ought to add closer shaves and easier honing methods to that list! I happen to think there is more to it than that, but all the same, there are no panaceas unless you work for Merck, Sharp and Dohme or their ilk. . . . . pretty damn good after decades of learning! So true! There's more than science --- the art, talent, and intuitive qualities of the process. Over the course of these past two days I've experienced shaving joy. The straight razor is still in the box. The stones and strops are undisturbed. The General razor / Kai blades are ZeroZipNada effort to use. I'm smiling ear to ear. I'm not trapped by frustration with the Quest for Shaving Perfection, tied to a dependency on a straight razor. The straights are a wonderful pastime and diversion when I want to emulate my grandfather out on the farm with an old dull straight razor when he would shave on Sunday morning before loading up the family and heading to town for church. Exactly what Doc Chris is talking about when he says "pretty damn good after decades of learning." I'm so happy to know I have experienced the straight razor alternate universe, and even happier knowing I never gave up on finding the finest (safety) razor and blades available to satisfy all of my perceptions and expectations in the successful achievement in the Quest for Shaving Perfection. I have come to realize that I would have never understood just how good a shave experience can be without having to go first through shaving h*** in order to reach my destination. I've never given up on the ultra expensive straight razor world of my forebears, but I'll never prefer them over the cheapest and best currently available. Sounds to me as if you should be ceremonially stripped of all your straight razors and banned from posting in straight razor forums! I have a General too. I agree it is a lovely safety razor. I still feel there is some point - some satisfaction - in trying to attain perfection by my own hand. If you have given up on that and feel content with your choice I'm pleased for you. I still think there is an equal or better edge that I might make for myself somewhere out there. Fortunately there is room for all of us, both in this forum and in the world at large. Thanks so much for embarking on this with me. Your observations were more or less in line with my own on this and it's nice to see some of the learned hands come up with what you've come up with. I will say I do agree that this can be a method to use on a recalcitrant razor. It seems to coax an edge where more traditional methods do not. I wonder if it speaks more to the quality of steel of such a blade more than anything. Dr. Moss I know you mentioned the 1K stone being more for bevel setting but the observation by Todd that all edges, commercial as well as traditionally honed, wind up as double-beveled got me thinking. Maybe the 1K drops the bevel down to a single bevel for re-honing quicker if not too many strokes are employed. I'd say around ten round trips on a normal razor. I know that's all it takes for my TI's. If It may also depend on the stones employed. Were I to use my Shapton 4k to touch up a razor it seems to take forever to get it to level that bevel. If I recall, my Norton 4k did it quite quick. Anyway I kind of like my Shapton 1K for that purpose. Doesn't seem to remove too much steel either. Hopefully I'm making sense here. Indeed this was a great road for me to travel to liven up an old habit I'm glad others may have gotten a thrill out of it as well. I'd love to have Todd review what breadknifing an edge may do to an edge before honing it. I know Maestro Livi employs it and, like Dr. Moss I thought it showboating until I tried it. I may just be imagining it but now I think it actually helps deliver a smoother edge. The jury is still out though. Gary, I am very happy for you finding a road to Rome that gives you satisfaction. There are many and we should enjoy all that we can. Travel on in good health! Just this afternoon I was thinking that even though the scripted method Todd provided (with much thought and effort, which is deeply appreciated) didn't work for me even though I wanted it to, I should look at a more conventional means of sharpening the Red Imp Wedge. I like that razor and now that I've made a start at putting an edge on it, I want to see if I can make it shave like it's supposed to. Lately I've been psyching up to give it another shot. I'm thinking I should devote a day or two to some quality time with two or three straight razors. The Imp Wedge for sure, and another one or two from the stash. After today's shave and inspired somewhat by this thread I touched up the TI on the red pasted Dovo balsa strop followed by my leather pasted crox strop. I thenstropped on my Dovo pasted linen followed by the Jemico white, the Jemico red, the plain linen of Magic strop, and of course the leather of Magic strop. The HHT test fell hairs silently a the slightest touch, root up. Looking forward to tomorrow's shave. True to my word, this morning I picked three of my favorites for which I broke out the stones and made them all shave ready for myself. I've chosen the Red Imp Wedge 5/8; the SSA Eskilstuna quarter hollow 6/8; and the Dubl Duck Special #1 full hollow 6/8. After flattening the stones I started with the Norton 1000 on the Red Imp because it needed a bit more work due to an experiment I conducted earlier in this very thread with some DMTs. Then on all three I used the same sequence: Naniwa 2000, Norton 4000, Norton 8000, Naniwa 12000, and finished on the Escher. After the stones were completed I stropped on the Jemico Red, the linen and the leather. They're all ready to use now. In the photo below you will see that they are all freshly oiled and looking good. I'm looking forward to using them this week. After sharpening and using 3 nice straight razors over the past few days, I have enjoyed the project throughout. It was a good opportunity to refresh my body of knowledge (however meager it may be) as regards that form of whisker removal. It was fun and I must say every morning I woke up eager to strop and shave with the designated straight razor of the day. Muscle memory was in full song, no struggle at all to pick them up in either hand and shave. I had forgotten how the newly shaved whisker stubble feels after having been cut by a straight edge. It did take a bit of restraint to resist the temptation to compare the results with certain other modes of whisker removal. Overall, I'm happy I did it, and am looking forward to the next time. I enjoyed this week's straight razor adventure so much that I'm going to do it again sometime soon. You can even do it every day if you want to! Thanks for the encouragement. I won't give up my General, but three shaves out of every few weeks or so will give me an opportunity to spend some quality time with my beloved straight razors and the rocks. I've chosen the Hart Steel 6/8, the Boker King Cutter 7/8 (13/16? ), and the Filarmonica Novodur 14 for my next round of SR sharpening and shaving.